Dieter: This is more a fuseki question for professionals. I have not the slightest idea what the severest play may be. Charles Matthews Asking for the most severe play may be a valid question. Has White made a mistake, though? If not, playing a severe move may not be correct. And severity is usually applied to counter overplays. So are we assuming that White 8 is an overplay? fdv: According to my little database with Kombilo, White 8 is not the good move, White must respond Q18 or K16 or L17. HolIgor ponders: as White I'd play 8 before 6. As White did not finish in the upper right corner and started at the bottom. I see four plans for Black: a hasami at the top, probably at K16, two usual plans at the bottom, namely P4 and K4 and a wedge on the left side. If Black plays P4 then he will be able to pincer either at the top or at the bottom, so the situation will become miai. Probably that is the solution. At the same time I have to admit that players of my level (IGS 1k, KGS 1d) or close (Dieter, Avatar etc) usually don't have a clue about fuseki. Yet I think that I can solve the first three problems of the series. Dieter: Yes, the first three are more basic. DaveSigaty: I also would say that Nando has come up with a problem that is far from basic! I doubt that there is a "solution" as such. At first glance it seems like Black would like to punish White's tenuki at the top. On the other hand this stone is not heavy right now, the 3-3 point is open and White can choose to take a second move elsewhere if she likes. The indirect way is to attack the white stone at the bottom and force it toward the top, hoping to create a splitting attack. P4 doesn't achieve this, instead it allows White to extend to the left (to K4 for example). If Black then plays hasami at the top, White can enter the 3-3 point knowing that she has already limited Black's ability to expand the moyo that will result. Holgor's suggestion of K4 is more appropriate. I would go one step further and propose L4. This is a current hot topic in the Chinese Fuseki (20 games from late 1999 - 2002 in GoGoD CD). It is quite a severe play. Immediately trying to settle the white stones by attaching at Q4 hasn't worked well in practice (Black won 8 of 10 games in which it was tested). A better approach has been to exchange 2 for 3 and then play on the left at 4 or a, inviting Black to try to attack the right with something like 5 or b. 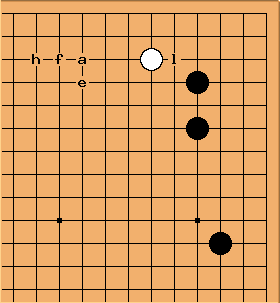 White's intention is to escape toward the top, limiting Black's area on the right along the way. However, the original exchange at the top not only left behind a potential target but put Black one step ahead in building right-side territory. White would be forced to come up with a new approach to handling Black's attack at 1 here. Dave This is a great question! :-) I also agree with your sensei. The attachment to make White heavy is just the 'instinct' that you want to develop. 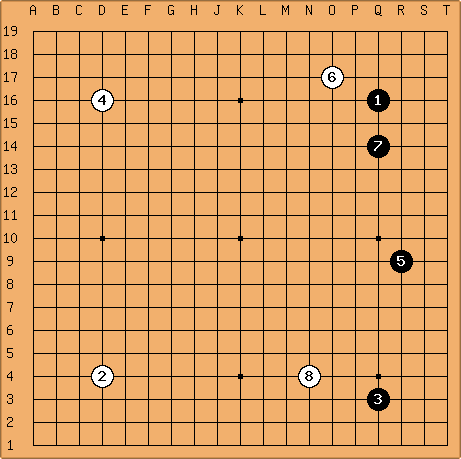 But one feature of modern Go, especially as it is being played in Korea these days, is the idea of using approach moves like that white stone in the upper right as kikashi in order to fix the early shape of the game overall. Whether this is reasonable or completely off the wall in this particular situation is far beyond my ability to judge but I enjoyed the question. There are not many cases but look at the win ratio - out of 11 games, White won 9! Why not tenuki more often - at last here is the sure win for White :-) Note that the distant pincers by B (h, f) are related to the individual game shapes in the upper left. HolIgor: The number of games is not that large and one would like to know for what White usually trades that move at the top. Could it be that a move at the bottom in the initial problem was larger after all. I have to admit that I did not see the variation proposed as the solution. I considered a hasami and forgot that one can try to make the opponent heavier first.